The kitchen trend is seeing a move towards natural materials,monochrome minimalism and patterned backsplashes. Customize these trends in your own kitchen with natural stone countertops, and a few other tips to update your kitchen to feel more fresh and inviting. Natural tones and materials are big across all interior design hemispheres, including kitchens. An accent wall in stone or brick will add a rustic feel, and if done right, will look terrific for time to come. Current kitchens can be ripped apart to expose old natural beams, which look fantastic with stain or beeswax. New builds and designs can build beams and tongue and groove into the walls and ceiling, which are absolutely worth the finish it gives. When going natural black for countertops, use black granite or quartz. Whether left glossy, or given a dull matte finish, this is a popular trend to use best when in contrast with a cool white interior. The monochrome trend has been around for some time, but this basic look is has been revamped. To avoid a cold uninviting kitchen experience, add some natural wood accessories, which will do wonders to the aura of the room. For a backsplash solid slabs of marble, strips of glass or other solid wall coverings pull the look together. Kitchens are yearning for a spark of excitement and edge, which is why interesting and colorful backsplashes are popular. Look for tiles with interesting patterns, colorful splashes or exotic designs. To complete the look, keep the rest of the kitchen minimalistic. Hidden spots under cupboards have been the prevailing trend in kitchens for the past 5 years, however now we are seeing a move back to exposed lighting. Look for light fixtures, which are showpieces in themselves. If you have a monochrome minimalistic design, go with a modern pendant light. If you have a traditional kitchen with lots of natural tones, use a more traditional brass light fixture. Kitchen cabinets will always be useful in all kitchens, but now we’re seeing a trend towards open shelving. Why hide away those eye catching kitchen accessories and crockery behind closed doors? These pieces have design and appeal too! Now people want to show off not only their fancy kitchen, but also everything else in the kitchen. 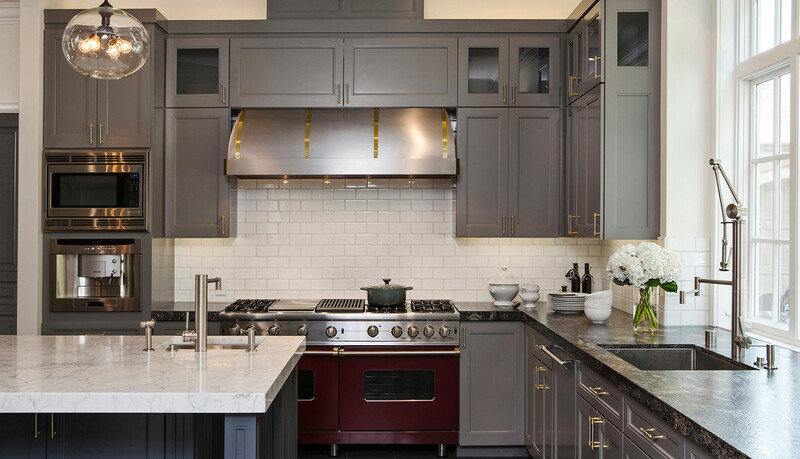 Lately there has been a shift toward warmer metal tones such as brass and copper, edging away from the brash, stainless steel and chrome colder metals. Iron and similar tones are making a come back, very much learning towards the timeless traditional. Copper accessories, utensils and bold outlandish copper kitchen hoods also make a bold statement. Small, compact corner sinks make an ideal solution for small kitchens. Most kitchens don’t utilize the corner for anything more than a countertop or alliance, so this fresh little number is making a triumphant entrance into kitchen design.